Unless you’ve been living under a rock somewhere in the South Pacific for the past month (lucky), you know that everyone in America has been battling polar vortexes, Arctic wind chills, and snowstorms. Today, half the country is literally under some kind of wind chill advisory, and this morning when I left for work, the wind chill was -21. It’s winter y’all, and we’ve just gotta get through it. And when it’s this cold outside, it’s the best time of year for a nice, comforting hot meal. Right? One of my favorite dishes right now is probably one of the easiest and yet the heartiest things you could make to stay warm and healthy: Black Bean Cremini Mushroom Soup. I’m trying not to eat a lot of meat right now (with the exception of my nightly tilapia fillet), so I have to find my protein sources somewhere else. In addition, because I am wholeheartedly NOT a morning person, I can still sleep in until 7:30 and make this soup for my lunch as I am getting ready for my work day. Heat the oil over medium-high heat in a saucepan or soup pot. Add garlic, onions, and mushrooms and sautee for 2-3 minutes. 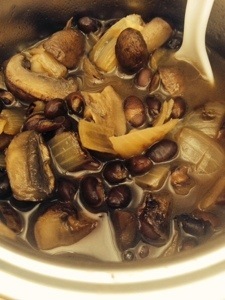 Slowly pour in broth and add black beans. Add spices if preferred. Bring to a boil and reduce to a simmer for 10-15 minutes. All of my ingredients were purchased at Trader Joe’s making the total cost per serving only $1.83. According to MyFitnessPal, it has 194 calories, 0.6 g fat, 522.5 g sodium, 481.9 g potassium, 34.7 g carbohydrates, 10.8 g fiber, 5.5 g sugars, 13.4 g protein, 2.4% vitamin A, 23.4% vitamin C, 10.3% calcium, and 24.3% iron.